Well according to the Orthopedic surgeon I saw on Wednesday, "The problem with competitive people is that they like to run, regardless.."
I felt it was inappropriate to laugh. I really wanted to. The snot rockets were close to being launched. I could feel the hysterical laughing building. Yes, I was consistently asking when I could run again. Yes, I did break myself running head-long, unbidden down a 20% down-hill ascent like a lunatic. Yes, I think I did mention I had some new running shoes coming in the post. Yes, I did keep mentioning that I had this race I really need to be in at the end of September. However, all I could do was nod at his assumptions. Hold in the uncontrollable laughter. Put on a serious face and pretend that I was this "typical runner". I had to, because.. well if they knew the truth - this is not how a 30 *cough* someone should act. So why was I SO eager to run in September. Was it to be first? Was it to impress people? Did I want the accolades Me? Heck No. I am a mediocre runner at best. Okay, I am not back of the pack, but I am not the front. I am not dedicated, I am not strong-minded enough to be any better. I always wonder how good I would be if I actually DID train. Then the thought lapses as I realise that sort of notion requires effort and organisation. So why was I pestering the surgeon about when I could run again? Two reasons. Firstly, I LOVE running. I get excited about it. Even now, when I know I can't run for another 4 weeks at least, I am not sad, just excited to get back to it. The thought of running that first half mile - well I feel like a 6 year old who has just eaten Thanksgiving turkey and realised that the next holiday is Christmas. I am planning it in my head - just looking forward to the joy I'll get. I won't care if it's roads or slow or well.. just 5 minutes. I just want to get back there. I don't need to - I just want to. Secondly, I have been given a fantastic opportunity to run the New York Barefoot Run in September; with no real expense to myself (Thanks Merrell). This may be the first weekend I can run and I want to experience it all. I want to meet all of my friends (old, new and currently non-existant), go to all of the clinics, try out new things and most importantly meet people who don't think I am a local freak. 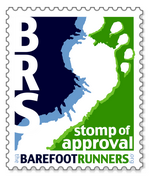 I also get to see (although meet and talk is optimistic) some of the big players in barefoot and minimalist running. Do you think I can go to an event like that and NOT run? It's like taking a kid with braces to a candy store and telling them everything is off the menu. So yes, I want to know when it's safe to run. I have no idea where these "other" pre-conceptions come about. [ Note: Okay, re-reading the first couple of paragraphs, I can see why the Doctors were confused]. In the last few weeks Doctors have called me athletic and competitive... as if I take this stuff seriously. They mention Sports Doctors and Surgeons. They look knowingly at me, yet fail to see. I am a middle-age (ish) woman, who has a normal BMI and a tummy that my son lovingly calls "a comfy pillow". I am not fast, I am not elite, I do not run exceedingly long distances in stupidly quick times. I am and never will be a Boston/Western States graduate. It's just that people seem to see me as competitive because surely that is the only reason you do something. Running, is still not seen as something you do for fun. The goal is still seen as the end and the numbers but not the journey. You are not allowed to run because you love the kid-like feeling it gives you. I am old enough to know better. Life is serious; exercise is serious; running is serious. (Apparently). I am being taken on a free-trip to a race to see super cool people, I get free beer, I can hang out with my super-hip friends and I am liable to make such a fool of myself when people realise I am NOT what they expected, that I am unlikely to be invited back. This is a once in a lifetime opportunity, of course I don't want to let a little thing like a broken knee mess things up. Four weeks ago I injured my knee running a local trail race. Since then I have had examinations, scans, tests and everything else that goes along with being injured. I have had suspected causes, vague guesses and hints about when I can go back to running. And yet the jury is still out. I have finally received my MRI results and in some ways the news is good and some ways it's bad. I haven't damaged the cartilage, I haven't torn any ligaments, it appears I won't need surgery. YEA!!! Let's bounce up and down in rejoice. This is what my physiotherapist suspected and I was hopeful that it could mean a speedy return to running. My knee has been feeling pretty good. It twinges, it aches, but I have been walking about, I can put weight on it, I have even been doing some light training on the elliptical and a load of physiotherapy at home. But, oh, okay, small undisplaced fracture of medial tibial plateau. That doesn't sound so good. Even so, that could be just a stress fracture - I have had those before and this is mild compared to that. Then I make the mistake of "googling" it on the interweb thingie. WHY did they decide to invite the medical community onto the internet? It's like those books hypochondriacs buy to discover they are dying of a rare disease when all they have is a case of indigestion. It does no good. The more I looked the more I wish I hadn't. Knee casts/braces for up to 16 weeks. Yeah, right, like that is going to happen. I have a 6 year old and 8 weeks of summer camps and activities. No weight bearing, crutches *swear violently* ... This is when I decided to walk away from the computer and adopt the technique I have been adopting lately; ignorance and alcohol! I await what the Orthopaedic surgeon says -well whenever I manage to get in to see him, this is Canada after all. I have been carrying along just fine over the last few weeks; I am still relatively chilled out and relaxed. I have had enough to occupy myself and I have taken the rest from running as a gift. Like a heat-filled vacation in the sun -except summer is skipping Vancouver it seems and we have had very little sun or warmth so far. I have used the time catching up on things. Spending time with D who is now off school, seeing all of the wonderful things coming out of the "Run Smiley Collective", sleep, you know the simple things in life. I find (at the moment) I am still running smiley, I am just not doing the running bit. I am still finding the small things in life to rejoice in. Although I can't run through the woods, it doesn't stop me walking through them (well until the Orthopeadic surgeon decides otherwise that is). It doesn't stop me planning what is still to come. "You can't have good without bad. You can't have hard without easy. You can't feel elation if you never know pain. The care free feeling of an easy run is amazing- you coast down the sidewalk or trail, floating under your own power, feeling like you could go on for hours. You smile at neighbors, stop to play with dogs, and take in the views. [...] On the other side, there's a joy in the hard run that is almost beyond words". This is my hard run. This is the challenge I have to go through to truly appreciate what it will feel like at the other side. I have so many exciting things happening with my running that are yet to come, that I am enjoying this hard road. I know my running may now be a long time coming (well longer than I hoped), but that first mile of running under my own power will be so much sweeter. (Saying that.. come back to me in 4 weeks time when I am ready to scrape the wallpaper off the walls and I snarl if you come in a 50 mile radius).